Dangerous heat and humidity is on the way for the Chicago area later in the week. A heat wave is expected to stretch across many cities in the central U.S. in the coming days, bringing the hottest weather of the year so far with extreme triple-digit heat. Tuesday will be in the mid 80s again, with mostly sunny skies and moderate humidity but as the week moves on, the temperatures will continue to rise by the day. The chance of severe weather returns late Tuesday night with the possibility of strong to severe storms into the morning hours. Temperatures will be turning warmer and more humid throughout the day Wednesday, rising into the upper 80s. Thursday temperatures soar into the mid 90s, but with high humidity will feel even hotter. 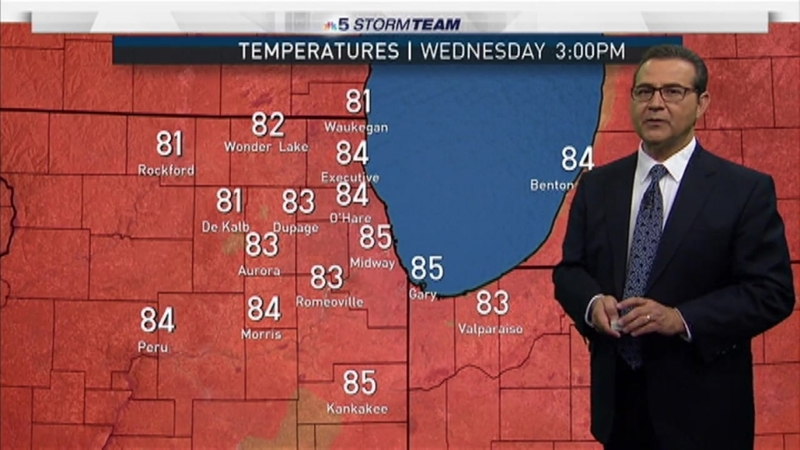 An Excessive Heat Watch takes effect for nearly all of the Chicago area Thursday afternoon. The watch, which warns of maximum heat index values between 105 and 115 degrees, will last until Friday evening. For Ogle, Lee, LaSalle, Grundy, Kankakee, Livingston, Iroquois and Ford counties, however, the watch will continue until Saturday afternoon, the NWS said Tuesday. The National Weather Service’s heat index is a measure of how hot it really feels when relative humidity is factored in with the actual air temperature. The watch means that "the combination of hot temperatures and high humidity will combine to create a dangerous situation," according to the NWS. Sweltering conditions remain through Friday, for another windy, brutally hot and extra humid day. Temperatures hover in the mid 90s with heat index values in the dangerous category once again, between 105 to 115 degrees. The National Weather Service warns heat-related illnesses such as heat strokes, heat cramps and heat exhaustion are possible in the extremely hot and humid weather. More people die each year from heat than lightning, tornadoes, hurricanes and floods, according to weather officials. Residents are urged to reduce strenuous activity, drink plenty of water and other non-alcohol fluids and avoid getting to much sun. The temperatures fall for the weekend, but only slightly. Saturday will be hazy, hot and humid with the chance of thunderstorms developing late in the day. Highs will be in the upper 80s to low 90s. On Sunday the Chicago area will see a small relief from the heat. A partly sunny and less humid day is in store with highs in the mid 80s, and cooler along the lakefront.